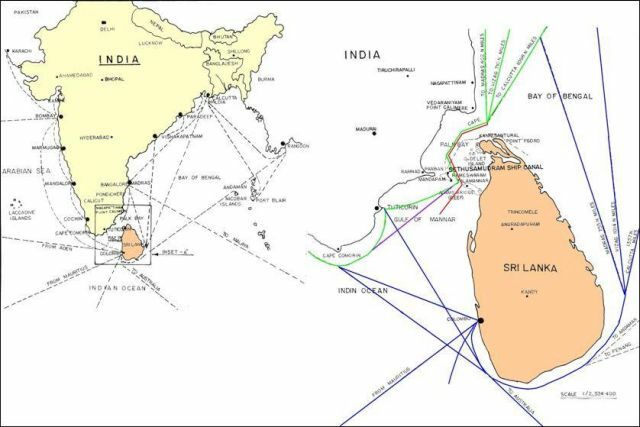 The Defense Minister of India in 1999, George Fernandes, proposed the Sethusamudaram project to cut a traverse across the Palk Straits between Sri Lanka and India. Military planners in India developed the proposals. However, due to financial reasons the project was not implemented. Questions were raised in Sri Lanka about the impact of the project on Sri Lanka, Tamil Nadu and the shallow seas. Later in 2004, the project was revived by the DMK Minister in the India Central Government for Shipping, T. Baalu, is driving this project. Sri Lanka has largely learnt of this project through the media. The purpose of this page is to serve as a clearing house for the salient articles and links regarding this project with a focus on social and environmental impacts on Tamil Nadu and Sri Lanka. The Government of India has decided to go ahead with the Sethusamudram Ship Canal Project (SSCP) and has passed the funds necessary for its implemention. 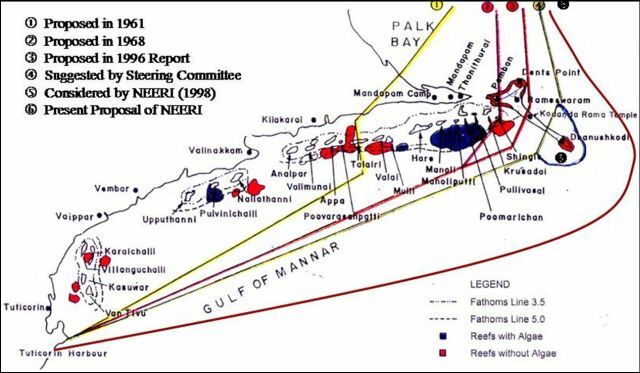 This project, which has been almost a century-and-a-half in the making, envisages linking the Arabian Sea with the Bay of Bengal by dredging the shallow waters to the North of Sri Lanka, thereby creating a navigable canal across the Gulf of Mannar, Palk Bay and the Palk Straits. These waters have hitherto not been navigable by cargo shipping, and the justification for the project is that it will save about 400 kms of sailing distance between the East and West coasts of India. In order to create this passage, two channels would have to be dredged, one across Adams Bridge (the chain of islets and shallows linking India with Sri Lanka) just South-East of Pamban island and another through the shallows of Palk Bank, deepening the Palk Straits. The total length of these two channels would be 56 kms. The initial excavations would produce in excess of 80 million m3 of dredged silt and sand and subsequent maintenance dredging to keep the passage open is estimated by NEERI to require 100,000 m3 silt/sand per year to be removed. In computer model's of the ocean circulation around Sri Lanka a difficulty in simulating the flow around Sri Lanka is that there is no estimate of the actual volume of water that flows across the Palk Straits. When the gap between Sri Lanka and Tamil Nadu is kept closed, the regional oceanic behaviour are reproduced realistically. When a narrow channel is left open across the Palk Straits, the currents gushed rapidly through it distorting the ocean currents. Since, the sea is shallow across the land bridge from Mannar to Rameshwaram, there will be little flow across it as intuited by the model. If indeed there was a sufficiently large passage, part of the EICC and WICC will gush through the Straits.